There are 2 main types of hardwood flooring. Out of the box, and custom. We only provide floors that are customizable, bespoke, and truly unique. Our floors can make a statement, or simply blend in the space. With our process, we have great control over the appearance and durability of a floor. We can tweak the texture, colour, specie, board size, construction type, and sheen. Most commonly, a floor will be made from one specie. However, multiple species can be used to create a floor and looks no other. A good example of this is the flooring on the Ellen Degeneres show. See what options we have and explore the possibilities of our unique products. Our reclaimed materials usually come from barns and old buildings in Ontario, Canada. However, we sometimes obtain lumber from other provinces or the USA. There are unique features that are indicative or specific to antique wood. 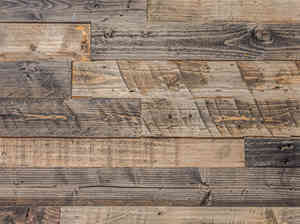 Our wide plank flooring is mainly sourced from Canada. At times, we will use lumber from the US if we cannot source locally. Our hardwood flooring is installed in Restaurants, shopping areas, office space, cottages, and homes. Patterned flooring has been around for thousands of years. It may not be the most common way to install a hardwood floor, but the results are always fantastic, eye catching, and memorable.